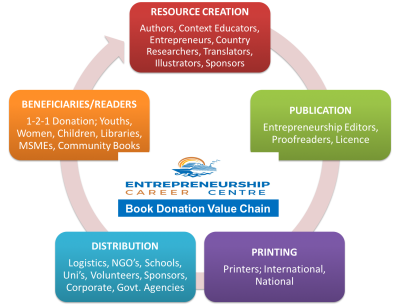 Entrepreneurship Career Centre (ECC) is a non-profit dedicated to entrepreneurship career development research, training, coaching, mentoring, advocacy and education. We showcase, promote and celebrate worldwide aspects of entrepreneurship career opportunity identification and development. The wealth of a nation depends on resourceful humans who develop the economy through entrepreneurship. The ECC encourages society to action implementable support for an entrepreneurial economy. This is a desirable goal, and alongside the development of empirical and theoretical contribution, provides a great rationale for our organisation. We plan to impact the world through positioning entrepreneurship as a viable career and employment choice for millions. Hence, we design and implement programs that facilitate entrepreneurial education, the perception, supply of entrepreneurs, ability and the competence needed to sustainably start and operate feasible businesses, raise potentials, and alleviate poverty. Additional to researching and advocating policies that create an enabling environment to accommodate all forms of enterprise to enhance work and wealth creation. We aim to enable understanding that the entrepreneurial spirit is not about materialism but building social and economic value that develops humans and nations. Entrepreneurship careers change the world, create wealth, alleviate poverty, feed generations & develops society.